Through the Eyes of Weidenaar, commemorated the works of local artist and internationally renowned printmaker, Reynold Weidenaar. This exhibit celebrated the 100th anniversary of the birth of Rey Weidenaar, showcasing a large portion of the GRPM’s unparalleled collection of Weidenaar’s prints, plates, tools and personal effects. The collection, a majority of which was donated by Jay and Betty Van Andel, speaks to the history of Grand Rapids from the artists’ point of view. Over 100 works by Weidenaar are on display, including 75 prints and 25 digital images. 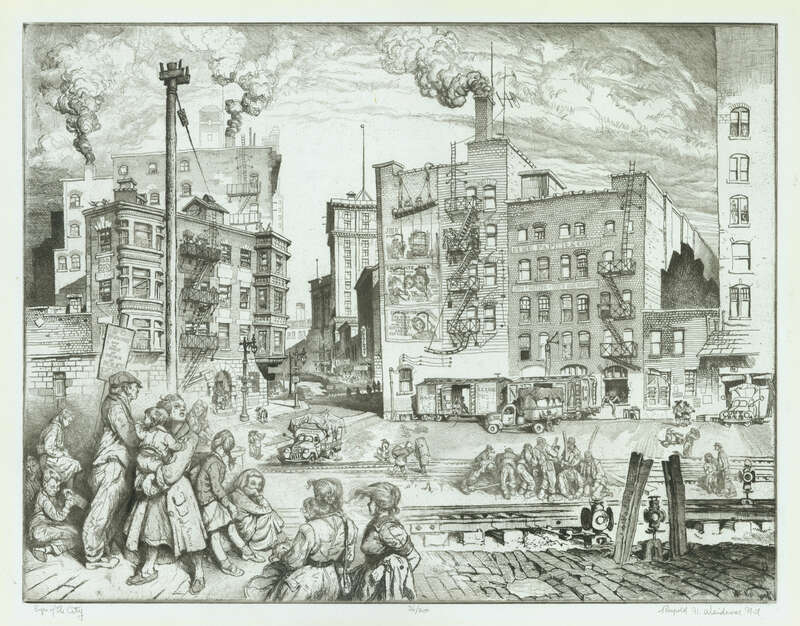 The exhibition will focus specifically on how Weidenaar incorporated local scenes, humor, and his own personal worldview and politics into his art. The exhibit asked visitors to contemplate Weidenaar’s self-designated role of chronicler of his community – not just its physical features, but its moods, sensibilities, and peculiarities. Visitors gained a greater understanding and appreciation for the work of this widely acclaimed artist, from right here in our own backyard. Weidenaar was a master at including humor and satire in his prints, often in subtle and unexpected ways. Visitors to the exhibit are able to use magnifying glasses and high resolution scans to explore prints like “It Was a Terrible Day” and “They Who Go Down to the Sea in Ships” for hidden messages and ridiculous situations. This exhibit was on display January 17, 2015 through July 5, 2015. Why is this text backwards? Reynold Weidenaar was a master of a technique known as intaglio printing. In this type of printing, the artist uses special tools to etch an image into a metal plate. The plate is then coated with ink, a piece of paper is placed on top, and the whole thing is run through a printing press, which transfers the image to the paper. In order for the image to come out correctly, the artist much etch everything into the metal plate backwards. This is especially impressive when you consider the detail and complexity present in many of Weidenaar’s prints. See the GRPM’s unparalleled collection of Weidenaar prints. Reynold Weidenaar was born in Grand Rapids in 1915. He studied at the Kendall School of Design and then at the Kansas City Art Institute. He won national awards while still a first year student. After moving back to Michigan from Kansas City, he quickly achieved fame and acclaim. He taught at Kendall School of Design for many years, but is best known for his exquisite black and white mezzotints. Reynold Weidenaar was internationally acclaimed for his work, focusing on local scenes, humor and satire, his personal worldview and politics in his work.